For many people experiencing homelessness “life is an emergency.” They spend every waking moment in fear because they are homeless. There are many situations that make this a valid statement. Families with children, people who are old, disabled people, frail vulnerable people. All acts of kindness and support are very welcome to them. We try to take the “sting” out of life. 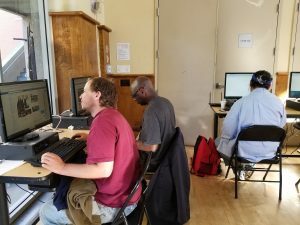 Some are using computers to find work or families. This week we have put two families into a motel for the week so they are safe and able to concentrate on the things they need to do to better their life. We battle the system for them and try to find resources for the things they need. Right now they need a deposit so they can go into an apartment. One of the families has some income and the father is about to start a new good paying job February 12. We are most hopeful for them.